Fat Brain Toys aren’t just designed for children to have fun — they’re designed to challenge kids while they play, possibly helping them on their way to become the next great designer, architect, mathematician, or scientist. With a collection of innovative games and funky shaped blocks — anything from turtles to the round style shown above — Fat Brain Toys offer options in the specialty toys and games arena that bring you back to the fundamentals in the same simple and educational vein of Lincoln Logs or electric sets. The company founded by Mark and Karen Carson is a small, family owned and operated busisness and they don’t have a lot of bandwidth to create and produce their collection of toys at this time. But that could change — right now they’re one of American Express Open and Facebook’s Big Break for Small Business finalists! If you want to help Fat Brain Toys win $20,000, be sure to vote for them below. Fat Brain Toys focuses on open-ended toys and games that can educate kids as they have fun playing. Twig, shown above, for example, has won numerous awards including Dr. Toy’s Best Green Product and Creative Child’s Toy of the Year Award. The 72-piece set is made from highly renewable rubberwood and finished with water-based paints giving them an eco-conscious angle. 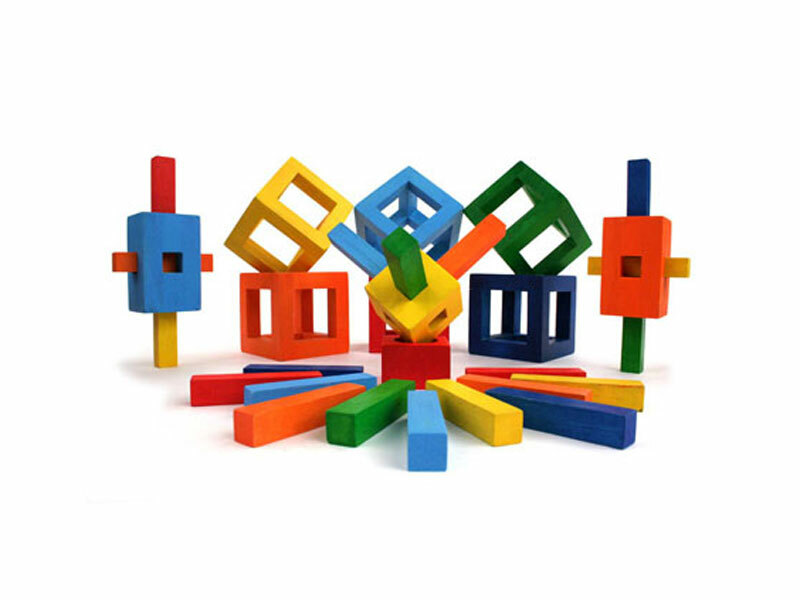 Because of the unique shapes and ability to connect the pieces, kids love building with these colorful blocks. Reptangles, another favorite, are a turtle-shaped inter-locking building system that can become a mathematical exercise as kids begin to understand the polyhedra shape. Each set includes 24 turtles that can snap together in a variety of ways creating simple towers or more complicated truncated octahedrons. Just two turtles can be connected in over 100 ways! Fat Brain Toys entered the American Express Open and Facebook’s Big Break for Small Business competition along with 11,000 US-based small business owners hoping for their big break. Now the family-owned toy company is one of ten finalists with the chance to win a trip to the Facebook headquarters for a social media consultation and $20,000 to help grow their business. Fat Brain Toys aren't just designed for children to have fun -- they're designed to challenge kids while they play, possibly helping them on their way to become the next great designer, architect, mathematician, or scientist. With a collection of innovative games and funky shaped blocks -- anything from turtles to the round style shown above -- Fat Brain Toys offer options in the specialty toys and games arena that bring you back to the fundamentals in the same simple and educational vein of Lincoln Logs or electric sets. The company founded by Mark and Karen Carson is a small, family owned and operated busisness and they don't have a lot of bandwidth to create and produce their collection of toys at this time. But that could change -- right now they're one of American Express Open and Facebook's Big Break for Small Business finalists! If you want to help Fat Brain Toys win $20,000, be sure to vote for them below.